This year's holiday ebook collection features more than 45 recipes to help you prepare a traditional Thanksgiving or Christmas dinner from scratch. 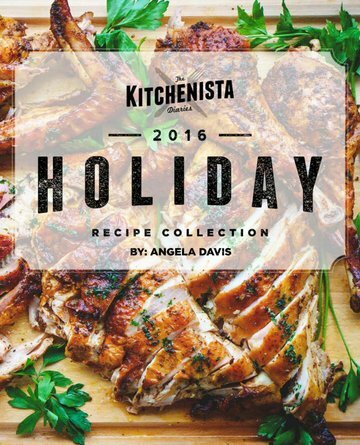 This year's holiday ebook collection includes over **45 recipes** that will have you covered for a traditional Thanksgiving dinner, from scratch! The collection features other alternatives for Christmas dinner as well. This one will carry you well into the winter holiday season and even special Sunday dinners throughout the year. ...and all other kinds of spice blends, starters, side dishes, main dishes and desserts to make your holidays complete. When I set out to write this year's holiday recipes, it was important to me that I stayed true to the way I cook. I am unapologetically meticulous when it counts, and it's true that I'll go out of my way to get the best ingredients I can source. If there is a step I can take to improve the quality of my dish, I take it. I will push for you to do the same, because the result is food that tastes real, and not the watered-down version of something that could be greater. You will find my process explained in a way that I hope is approachable, even for first time cooks. Some dishes are more involved than others but you’ll find some that are too easy to be true. Thanksgiving (or any big holiday dinner for that matter) is a marathon, and nobody shows up to run a marathon without having jogged around the block a few times. Start small with a few dishes that you can contribute to your family’s gathering, then work your way up to taking responsibility for more of the menu. The only way to get better at something is to practice doing it, more than once. There’s a lot of noise from television and glossy magazines this time of year, promising bigger and better ways to cook for the holidays. It’s okay to reject that. I’d encourage you to focus on learning some sound techniques, then allow yourself the time, room and grace to improve. The creativity and ability to innovate will come in time. What I can offer you in this collection is more than a set of holiday recipes. You’re going to get a little bit of hand-holding, a lot of tough love, and a great deal of solid advice to help you pull off a successful holiday dinner. My vision was a little bigger this year – I wanted to offer as close to one-stop shopping as possible. The recipes are intended to complement one another and much of the prep work is used for more than one dish. The more of your menu you plan from this collection, the more you’ll get out of it. My goal was to relieve you of the hassles of piecing a menu together from multiple sources so that you can focus on learning how to cook the food! I’m excited to share a beautiful collection of recipes that I believe you’ll find useful for Thanksgiving, Christmas, fancy Sunday dinners and everything in between. It’s all within your reach. This book is for the Kitchenista who does everything and the aspiring home cook who one day hopes to get there. No matter where you are in your cooking journey, who you’re cooking for, or what your reasons for doing it will be – there is a memorable holiday dinner in your future.